Sucre is the kind of shop that I wish I had nearby. It’s a cute shop located in New Orleans that specializes in sweets, mostly of the chocolate variety. 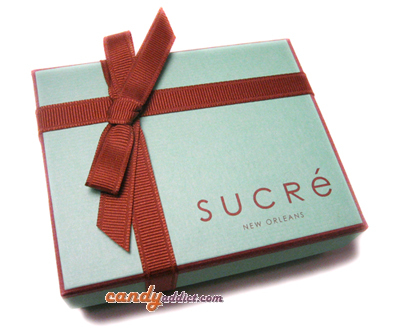 Sucre makes a large variety of bonbons, each one looking more tantalizing than the next. They kindly sent me a small sampling, and after opening the box, I didn’t know if I should eat them or just admire them: they’re so pretty! Sucre’s bonbons are also tiny, so much so that I was reminded of toys and after taking my photos of them, I had an urge to play with them. That would have been a bad idea for several reasons, with the more obvious being that these are carefully crafted and are quite delicate. I had chipped one of the painted decorative tiles in just moving a bonbon from the box. Tucking my playful urges aside, I read the included flavor pamphlet and tried to identify my assortment. I had nine bonbons to decipher from a list of twenty four different types. On with the tasting! Torrone: double cream milk chocolate paired with sweet hazelnut wafer crunch: Torrone’s size is petite: about 2 inches long, 1/4 inch thick and wide. The first bite was very rich, and I was surprised to find that the inside “wafers” are more like little puffs of rice. Silly me, here I was expecting a Kitkat! It feels very dense in the mouth and the hazelnut crunches are nice and chewy, providing a wonderful textural contrast. The flavor though, I find lacking. I taste sweetness, a slight nuttiness from the wafer bits and a little cream, but there’s not much chocolate flavor to be found. Blange: Inspired by Paul Blange’s Bananas Foster, this white chocolate ganache is finished with fresh banana and a hint of rum: This one is the gorgeous; the yellow color waxes and wanes, swirls and sweeps on the surface. The aroma is that of white chocolate: sweet with a little buttery note to it, no hint of vanilla at all (which is good since I prefer my white chocolate minus the vanilla sometimes). The white chocolate itself tastes sweet, buttery and just so pure. The ganache’s base is also white chocolate, with a very subtle kiss of banana, cream and a little rum (only in terms of a teensy flavor, there’s not burn or bitterness here). Simply amazing work, my second favorite of the bunch. Lemon Confit: A zesty ganache of dark chocolate and lemon: Mine arrived broken, so I was surprised to find how soft it was when I bit into it since I was expecting it to be quite brittle! The dominant flavor in this is the lemon and it’s very strong and fresh tasting. The chocolate ganache center was very creamy and had a slight “cooling” effect on the tongue, part of which was probably how it mixed with the lemon oil flavoring. Very light and refreshing. Magnolia: Pecan ganache finished with a southern pecan half: Magnolia is a very attractive bonbon with a nice oval shape and a fresh pristine pecan on the top. I first bit the nut off since it’s the most inviting and eye catching part of the bonbon. The chocolate in the bonbon was so soft, I was surprised how fast it collapsed when I took a bite. The favor is wonderful: sweet, with great burnt sugar and caramel notes that are backed by a wonderful flavorful dark chocolate. Sucre dark: Our signature, showcasing our single bean chocolate from the Maracaibo region of Venezuela: This is shaped as a small square with the Sucre starburst logo on it with a nice light aroma of dark chocolate. It has a beautiful first bite: the crunch of the thin shell and the ultra thick silky ganache underneath is like biting into fresh fudge: rich, giving and very dense. The flavor is very light and sweet and you taste more of the chocolate than the cream, which is lovely. Pistachio: Sicilian pistachios, cinnamon vanilla white chocolate ganache: This one is small and rectangular with a painted bright grass green tile on top. Upon reading the description, I was excited to try it. Cinnamon? White Chocolate? Sign me up! The white chocolate ganache was almost translucent in color and it reminded me visually of Crisco. The flavor, however, is out of this world! I don’t get much pistachio or vanilla notes, but the two flavors I wanted to taste most are standing in the forefront for my tasting pleasure. The cinnamon is so bright and fresh and mixed with the white chocolate… it appears I’ve just died and gone to heaven. Can someone make this into bar form, please? My favorite of them all. Meuniere: A New Orleans classic made sweeter. A brown butter and toasted almond infused with chocolate ganache: The shell with this one felt a little thicker than the others. The interior is a light cream colored ganache that is heavenly. It’s rich with flavors of butter, brown sugar and almonds and goes so well with the chocolate shell. Colored purple tile: This one confused me since it didn’t look like anything pictured on the website. It resembled some of the pieces in the tea collections but the design on the top tile didn’t match up, so I was very perplexed. My first bite confirmed my suspicions because I tasted the wonderful flowery notes of tea. I believe this one to be the Paris: Milk chocolate ganache scented with black tea infused with fruit, citrus and vanilla. Once I bit deeper into it, I knew I had pegged it correctly. The flavors in this are beautifully light and crisp and blend well with the chocolate. Avery: caramel and milk ganache enhanced by salt from the Avery Mines: This one looks like a chocolate covered macaroon cookie with its circular shape and fluted edges. It’s a rich ganache but with the flavor you’d recognize right away. It’s just overflowing with a fresh caramel flavor of cream and burnt sugar. Wow. Sadly, I didn’t taste any salt. I can’t help but wonder if the granules fell off during transit, but I’m sure the flavors would have been even more intense with them. Yum. Sucre’s bonbons are both a feast for the eyes and taste buds. The small size and stylish packaging make it a wonderful gift to a hostess, good friend, or even for yourself! I was a little surprised at the daintiness of the bonbons at first, but then I realized the size makes them much easier to savor and enjoy, which is something I really appreciate. It just goes to show that even with chocolate, good things come in small packages. Wow, all of those sound GREAT, especially Blange (I love bananas). I also love trying new chocolates (and candy) of all varieties… too bad this is another store where it will cost $16.00 + $16.95 shipping to get a box of 8 chocolates of only 4 varieties. So, in essence, to try 4 chocolates it will cost $32.95 or $8.24 for each kind (actually $4.12 per piece). I want a “one of each” box dang it. 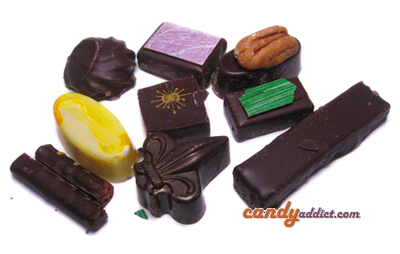 I want to try each one of a stores’ specialty chocolates, and I don’t want to spend more then $1.00 to $2.00 a chocolate (especially tiny ones like these)! Every chocolate site needs to offer a “one of each” box. I would pay $30.00-$40.00 (WITH SHIPPING) for 24 different chocolates (and that is spendy). The closest they have is 27 chocolates (of ONLY 4 varieties, again) for $48.00 + $19.95 shipping…so, $67.95 for four different chocolates. Arrrgh. It is always good to see what is happening in the confectionery circle. I think we are finally starting to see a real awakening here in America when it comes to quality bon-bons. Of course, we have always had lower-quality bon-bons under a number of guises and they surely have their own nostalgic appeal. Flavor, nuance, balance, and beauty are finally becoming paramount — the heralding of great things to come in the American market. I have not yet tried Sucre’s chocolates but clearly a fair amount of effort has gone into creating them and they are trying to make a quality product and surely, I’d like to try Sucre. What a gorgeous box! Yeah, the chocolate sounds good, but… what a gorgeous box!